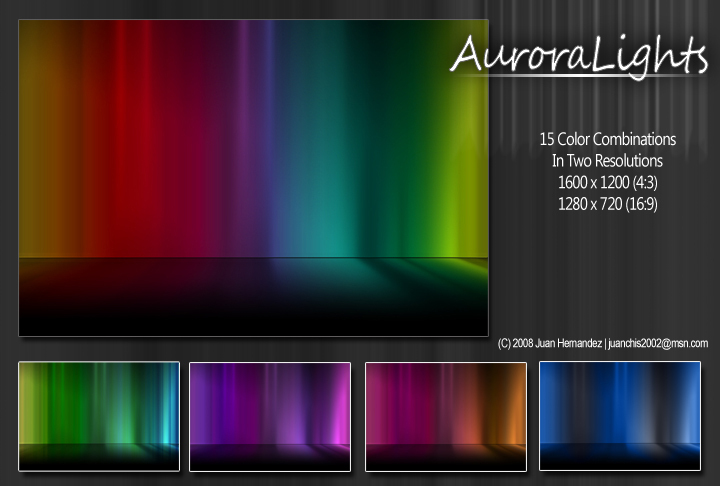 A new Aurora style wallpaper that I created back in April, originally to use as a wallaper for my TV (1280x720 and with one color. But here it is not with different color combinations. The pack includes 15 color combinations and in two resolutions, 4:3 (1600x1200) and 16:9 (1280x720). Don't know of anyone who uses that res. A proper 16:10 ratio (2560x1600 or 1920x1200) would be nice, more people could use the wallpaper then. ooo, yes please make it 1920x1200 these walls are soooooo cool!